Kyrie Irving (knee) will start at point guard for the Cavs Game 1 of the NBA Finals against the Golden State Warriors on Thursday. Irving went through his warmups on the court ahead of the game and will make his NBA Finals debut. OAKLAND (Sporting Alert) — Kyrie Irving remains a game-time decision for Cleveland in Game 1 of the NBA Finals at Golden State on Thursday night. Irving (tendonitis) has been restricted to mostly gym work because of a knee problem and is struggling to be fit for the game at the Oracle Arena. The All-Star point guard has been practicing and is determined to feature for the Cavaliers, but head coach David Blatt remains cautious about his chances. Irving missed Games 2 and 3 of the Eastern Conference finals against the Atlanta Hawks, but played 22-minutes and scored 16 points on 6-of-11 shooting from the field in Game 4 of the sweep. He admits that he was in pain, which is preventing him from doing some of the things he usually does. 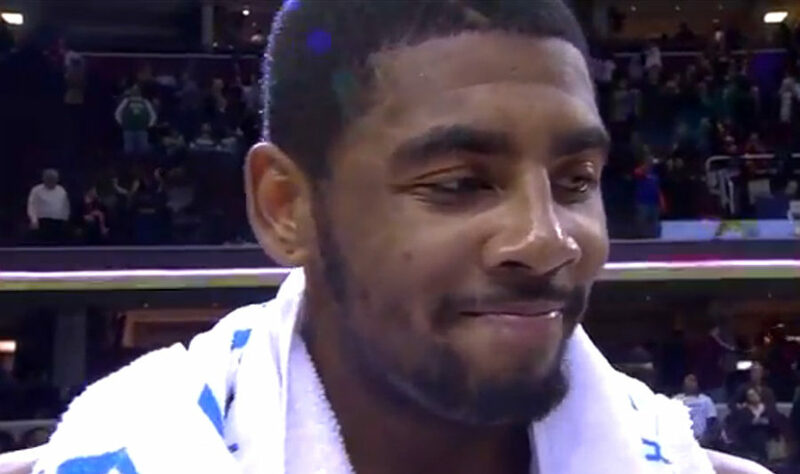 “It’s definitely tough,” Irving told reporters. “Because obviously mentally and physically you want to be in line. “It’s just like some of the things I’m thinking about doing mentally, you know, your body just kind of stops and you can catch yourself a little bit sometimes. Several pundits believe Irving will push through and play in Game 1. One thing for sure, if he does play, Irving wouldn’t be the only person guarding Warriors sharp shooter Stephen Curry throughout the contest.